The best things to do in New York during the holiday season. New York City is awe inspiring any time of year, but layer on a sweet helping of holiday cheer and New York City becomes pure magic. The exciting lights take a festive hue, and every shop window decks their halls with the latest and greatest gifts to spoil everyone on your list. Sure it’s a little cold outside, but every restaurant glows with warmth, inviting you to meet your friends over hot apps and spiked eggnog. If you’re lucky enough to visit the city during the holiday season there a few experiences that you shouldn’t miss to get you into the holiday spirit. I realize not everyone shares the same holiday spirit though. Some of us—perhaps those who fall on Santa’s naughty list—might find the typical Christmas hoopla a bit over the top, or maybe we just want to try an alternative holiday that pokes fun at tradition but doesn’t throw it out the window entirely. Well don’t fear, whether you’re in search of a classic Christmas experience or one that’s a little less traditional I've got some suggestions to make your New York Holiday sparkle. There’s nothing quite like a towering tree strewn with lights and sparkling bulbs to get you in the holiday spirit. All over the city you can spot majestic trees decked to the nines, and a few that might need a little help. Every year since 1933 locals and tourists make the trip to Rockefeller Center to take in their majestic 100 foot beauty of a tree. Now with head to toe LED lights and topped with a Swarovski star this tree shines brighter than the top of the Chrysler building. The tree goes up near the end of November and glows on until the first week of January. When: End of November to the first week of January. Touring around the worlds biggest cities each holiday season has given me a little insight into Christmas tree decorating. Some, like the Rockefellers, do it right while others… well not so much. One of my favorite things to do during the holiday season is to play spot the ugly tree, and let me tell you there are plenty to spot, even in a city as classy as New York. Take some photos or keep a mental note of who spots the most, loser picks up the drink tab that night. If there’s one thing that every romantic holiday movie taught me it’s that outdoor activities have a way of making cocoa by the fire that much cozier. As a result, skating is one of the top holiday experiences during the New York holiday season. The famous rink at the Rockefeller Center is constantly abuzz with festive skaters showing off their stuff. Sure this rink is right beside the famous Rockefeller tree, and you’re probably thinking you’ll kill two birds with one stone. But keep in mind you aren’t the only one with this grand idea, and if you want to skate this very popular rink you’ll have to arrive early, or get ready to wait in line. The rink holds up to 150 people, and since it’s one of the most popular holiday tourists attractions the admission to skate isn’t cheap. You’re looking at $25 for adults and $15 for kids, and if you’re a tourist you probably didn’t bring your skates so you’re also looking at another $10.00 for skate rentals. So if it’s your dream to skate under the Rockefeller tree plan ahead and get there early. For our money we’d rather grab a cup of hot chocolate and watch the skaters for a few minutes while we take in the tree, then bounce to a less congested part of the city. 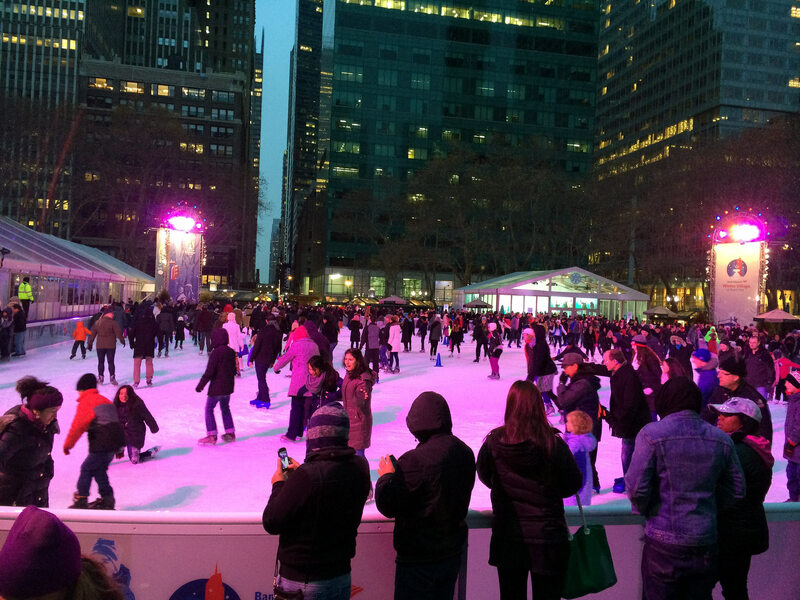 If you’re dying to skate head to Citi Pond at Bryant Park, or The Sky Rink at Chelsea Piers. Both rinks are considerably larger and admission and rentals are cheaper. Or if skating requires too much coordination for you why not head Central Park and try your hand a sledding? Pilgrim Hill is the steepest slope in the city and a perfect way to kill a few hours in the cold. To avoid the crowds check it out in the evening after the sun goes down and the kids are in bed. Or check out 91st Street pedestrian area where sledding has become the number one winter pastime. The theater is festive all year round, but during the holidays New York entertainers really put on a show. From classic Broadway that will warm your heart, to crazy drag-shows that will warm your...anyway, here’s a list of what to see during the holidays! Whether it’s on or off Broadway there’s something for everyone's viewing pleasure and budget. These are just a few of the classic shows this season. The New York Ballet performing the Nutcracker is perhaps one of the most beautiful displays of Christmas spirit in the city. This Christmas tradition has been going strong for 85 years with no signs or stopping—don’t worry the original dancers have long retired. We love the pageantry of this show and really there’s nothing like high kicks, sequin outfits to get you ready for the holidays. This guys is new to the scene but since it’s one of my all time favorite Christmas movies so the fact that it’s now on Broadway makes my holiday! I hear that Ralphie is all grown up, and it looks like he didn’t shoot his eye out so they made him one of the show’s producers. If holiday music is what you crave look no further than A Christmas Carol. The singing is wonderful and they cover all the goodies. For those of you who are looking for something a little less heartwarming check out these shows to get your holiday juices flowing. Not everyone has a magical Christmas, sometimes Santa's drunk and you’re Dad tells you he’s gay. For a dose of Christmas reality check out Naked Holidays, an alternative take on Christmas spirit. If the traditional Nutcracker sounds like it might put you to sleep, give this show a spin, it's the Nutcracker meets Moulin Rouge. This strictly for adults show mixes the classic Nutcracker ballet classic with circus, burlesque, cabaret… and a little pop music to pepper the soundtrack. Super fun, and really entertaining. Europe isn’t the only place to find magical Christmas markets. New York has a few of their own Christmas themed markets with food, gifts, and decorations to tempt your wallet. Although many are up to date with the latest payment technology you might want to bring cash just incase. 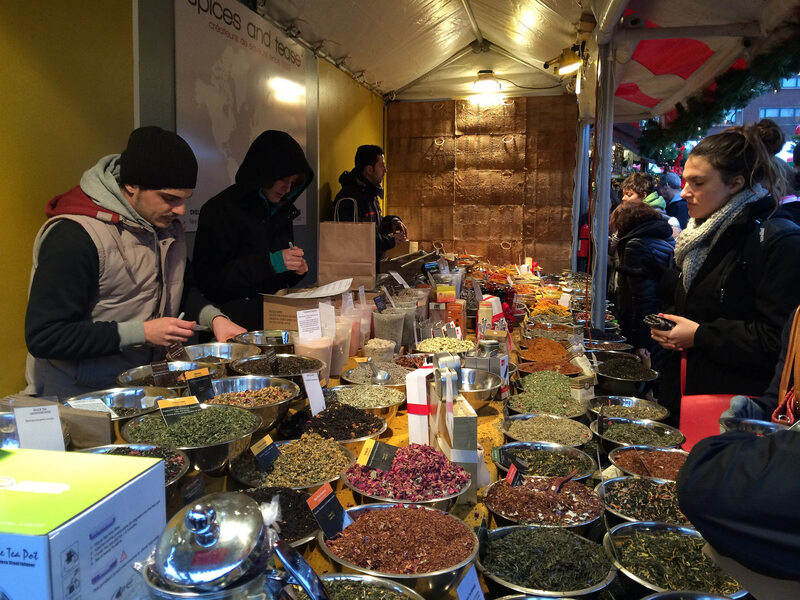 For upscale gifts and gourmet holiday treats check out the Holiday Market at Columbus Circle. The backdrop of Central Park makes this a particularly festive place to get some shopping done. The largest holiday market in New York has to be Union Square, with rows and rows of crafty gifts, accessories, trinkets, and food. If you only have time for one market, this is probably your best bet for quantity and quality of vendors. If you’re on your way in or out of the city via Grand Central make sure you give yourself a little extra time to check out the vendors here hawking a mix of commercial and artisan gifts and Christmas decorations. Since it’s inside you can take your time sans gloves to inspect each item before you buy. 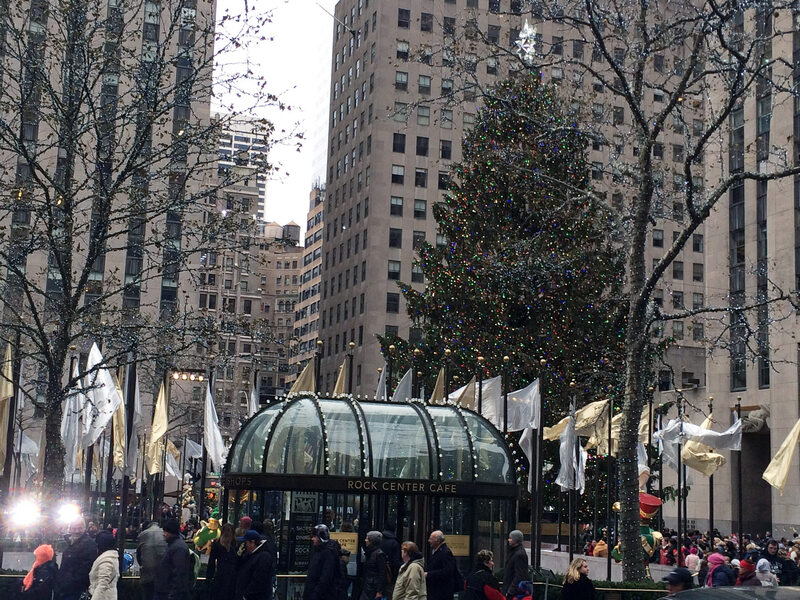 With 120 merchants packed into Bryant Park you’re sure to find something special for everyone on your list. Where: Bryant Park, between Fifth and Sixth Avenues and between 40th and 42nd Streets. If your friends and family cringe at Christmas themed gifts, and you long for some real shopping check out some of the limited time pop-up shops and markets around the city that keep the X-mas factor to a minimum. A collection of Brooklyn designers, artists, and craftspeople take over the Meatpacking district with innovative and fun apparel, accessories, jewelry, oddities and food. This isn’t the first year accessories design Jill Schwartz has run this popular pop-up holiday market. This is year six, and each year it gets better and better with an eclectic collection of cool apparel, accessories, housewares, toys, and designer goods. The market is only on for a short time so make sure you don’t wait to buy otherwise you might find yourself out of luck. As soon as that Thanksgiving turkey is stored in its Tupperware, retailers start preparing their shops for Christmas—and some pull out all the stops. From high-fashion winter wonderlands to Santa inspired workshops, touring the window in New York can be more fun than actually shopping the stores. The holiday season is when midtown sings, with all the big department stores clamoring for the best over-the-top, big budget display of holiday cheer. Start at Bloomingdales at Lexington Ave and E 59th Street. Then walk towards Madison Avenue to see Barney’s, then on to 5th Ave where you can walk the entire stretch catching Bergdorf, Saks, and Lord and Taylor. 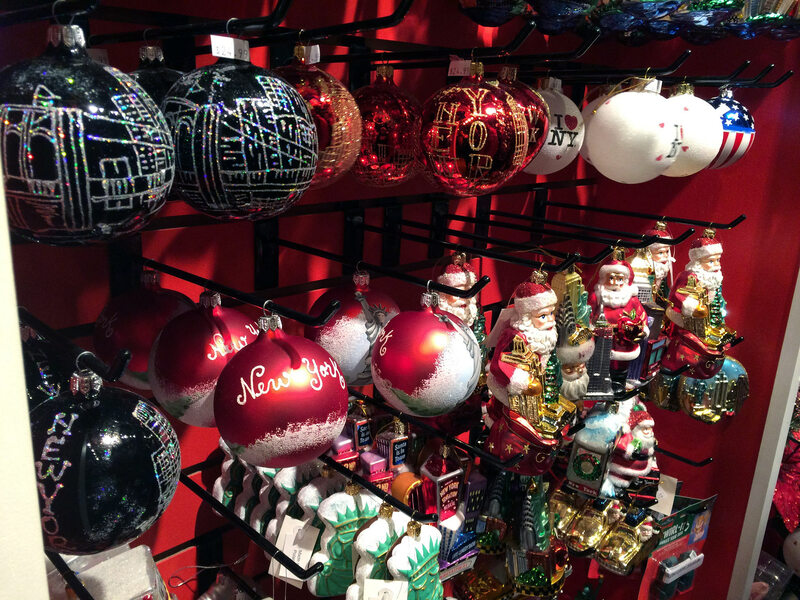 Along 5th you’ll see all the other major brands who get into the holiday spirit with colorful displays and big times sales for holiday shoppers. 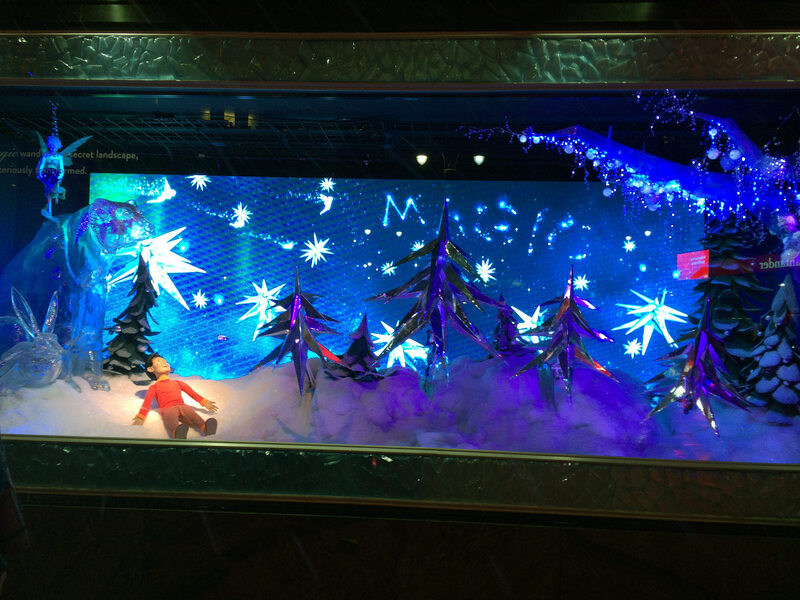 Finish off with the Macy’s window on 34th street, that will bring out the kid in everyone. If touring window displays is not your idea of fun, why not tour local drinking establishments? Check out SantaCon, a once a year convention that raises money for Toys for Tots, and the Manhattan and Brooklyn Food Banks. Each year people sign up to dress like Santa (or whatever holiday costume tickles your fancy) and tour some of the local watering holes spreading um, holiday cheer along the way. It’s all in good fun, totally ridiculous, and the perfect way to help out a good cause and meet some untraditional like minded people—which is really what the holidays are all about.